What is the purpose of childhood? It’s an interesting question and, counterintuitively, one that us parents sometimes forget to ask. Sure, we ask questions centered around our purpose as parents — and those are incredibly important to think about — but the kid-centric question is equally important. From an evolutionary standpoint, human beings have exceptionally long childhoods. Most species on Planet Earth accelerate to adulthood within a matter of a few short years (or less), but not so for us humans. Instead, human children remain children for prolonged periods, dependent upon their loving families to nurture them during the baby, toddler, youth, and adolescent years. Our relationship with our children undergoes a profound metamorphosis several times over the course of two decades. We adjust our parenting to meet the growing needs, and independence, of our children. But again, what is the purpose of this prolonged childhood? Its very length denotes its importance and, yet, we often feel the temptation to race ahead, to accelerate our kids on the path to adulthood. And certainly, one of our roles as parents is to prepare our kids for adulthood. But, in our view, this role requires a patient reverence for childhood and an embrace of its slow pace. We believe the purpose of childhood is to play; to create; to experiment and take risks within reason and without judgment; to let curiosity spark learning; to test the boundaries of our children’s will, hearts, and minds. These purposeful pieces of childhood, we hope, will allow our kids to grow in confidence, in compassion, and in love. Rather than short-changing childhood, we lean into it, trust it, and cherish its length. Because, someday, our kids will be adults. The strong roots of their extended childhood will enable them stand upright in the face of life’s storms; to be strong, resilient, and adaptable during life’s unpredictable journey; and to shine and contribute confidently to this beautiful world. For a long stretch, whenever you gave our little boy crayons or colored pencils, he’d busy himself drawing designs. Multi-colored, layered, creative designs. Meanwhile, if you gave his twin sister crayons or colored pencils, she was likely to draw whatever she saw in the world — a smiling face, clouds, flowers, rainbows. And then, seemingly overnight, our little boy started drawing rocket ships with intricate details, fire jetting out the back, control panels onboard, a moon in the distance. Faces emerged next for him — smiley faces, silly faces. And yes, he still draws designs too. Evolving and maturing at his own pace, our little boy is unearthing his own unique mode of artistic expression. We never told him to draw a rocket, and we certainly did not pick the day when he jumped from designs to detailed rocket ships. That was up to him. As it should be. As parents, we joyfully await these leaps, when we see our children maturing before our eyes, learning new skills, testing new boundaries, seemingly all of the sudden. But these leaps happen in their own time. They cannot be demanded. For kids, there is no command performance. We provide the loving environment for our children to grow, but like Mother Nature’s nurturing of a springtime flower, we cannot force this sudden burst of becoming. By holding childhood in reverence, we trust that each child’s journey of self-discovery and consciousness will unfold in its own time. In Waldorf classrooms, teachers practice “holding the question”— that is, holding off on definitively answering the question: “who is this child?” Rather than labeling individual children as the “smart kid,” the “athlete,” the “mischievous kid,” the “artist,” and so on, Waldorf philosophy counsels its educators against putting kids into a defined box too soon. As parents, we desperately want to answer this question. We lay awake at night, dreaming about who our children will become, dreaming about our adventures together, dreaming about their role in this world. We can dream, of course, but we must also be patient and flexible in our dreams. Our children will surprise us in ways we cannot foresee, in ways big and small. For now, it’s enough that our little boy loves to draw designs and rocket ships. He’ll share his next leap when he’s ready. We’ll be waiting, patiently and lovingly. Every year, I like to craft something special for my little ones’ stockings- there’s just something satisfying about using your own two hands to create precious treasures. Handcrafts have a way of making me feel productive, yet at the same time not busy- a glorious feeling for this time of year! And creating with natural elements lends a certain beauty and warmth that sparks such appreciation for all that is around us. 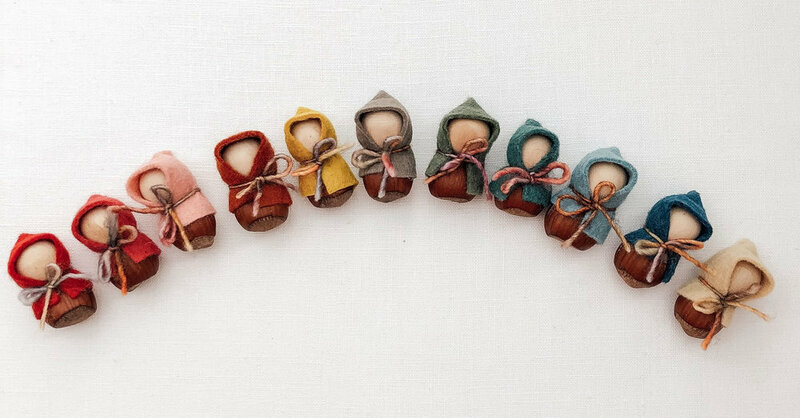 Plus, who can resist any cutie wrapped in wool?! These can be whipped up in no time and ready for stockings, nature tables, and little hands just waiting for a cute and cozy little friend. Thank you to our kindergarten teachers for teaching me to make these! They always have the best ideas :). It’s also possible to sand the bottoms gently with sand paper if you want them to stand up! That’s a bonus for high-achieving crafters ;). Enjoy all the stories, imaginary play, and cheery cuteness that these create! Our vision reflects an appreciation for Mother Nature’s goodness and the natural world that beckons us to explore. We are makers of merino wool children's wear. But our vision does not end there. We will never be content merely to produce a good for consumption. We succeed when we capture the adventurous spirit of childhood through the natural goodness of merino wool. Fast-forward to the present, this vision still sustains us, still motivates us, still encapsulates who we are and what we seek. We have never wanted to be a transactional business that sells a good for conspicuous consumption. We sought to establish a deeper and more meaningful connection with you, our supporters, our customers, our fellow travelers on the journey of life. We believe in the joy of using a well-made product. 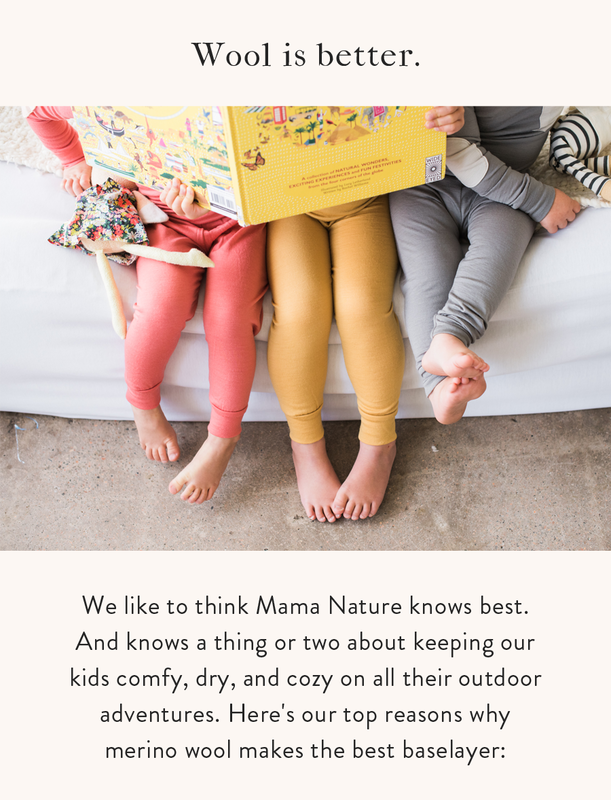 We believe in forging a connection to Mother Nature’s goodness by trusting her to clothe our children. When you look back upon Chasing Windmills, we hope that you remember the family ski trip (in which your kids stayed warm in their merino base layers); we hope that you remember the restful nights of sleep (in which kids rested comfortably in their super soft merino); we hope that you remember the peace of nature’s gifts. You see, to us, the joy is always found in using, not just acquiring, something that is true, beautiful, and good. The joy is in the adventures ahead. We thank you all, our supporters, for bringing our merino on your adventures, for making us a small part of your very big journeys. Hello Colorado! Starlight Market Is Back! To our supporters and friends in Colorado: we invite you to visit us on November 10th at The Kitchen Denver for our third annual Starlight Market. Hope to see you there! “Will you play with me?” It’s perhaps the most quintessential question of childhood. And it’s the question our little boy asked his uncle during a recent family gathering. “Sure! What do you want to play?” came the reply. And so they did. Our little girl joined in the fun too, as their uncle chased our kids with bursts of laughter ensuing. Evidently, they decided to roam around and mimic the roars of prehistoric animals, including sabertooth cats and woolly mammoths. They loved every second of it. Watching my kids chase their uncle, it struck me: this joy just happened spontaneously. It was not planned, researched, or analyzed. It just started with a simple decision: let’s play. Kids don’t feel the need to have all the answers. Life washes over them, and joy flows naturally. As grownups, we sometimes forget the wisdom of our youth. We fall into the trap of thinking that, for life to be fruitful, we must plan every hour of every day. Our overreaching minds tell us that we must have all the answers before taking the first step. To a certain degree, we are right. We have to plan for work and home responsibilities. After all, dinner has never prepared itself. But we can also embrace the wisdom of our children too. There are moments, everyday, when we can simply play, when we can embrace the present without knowing the future, when we can take the first step in a journey without a specific destination in mind. If only for a few moments, we too can discover the joy and freedom that our children cherish. Our shop is on a summer shipping break through August 14th, as we take a chance to soak up the goodness of summer with our family. So what does that mean for you all? USPS First-Class/Standard shipping is on us for all domestic orders during placed during our shipping break (August 7-14). All U.S. orders will ship out, via USPS First-Class/Standard, on August 15. And for our international friends, you'll save $5.00 off of your usual shipping costs during the summer shipping break too. A little something for everyone. Hope you and yours are enjoying the summer too! Oh, and stay tuned...we're also working on some new styles, including our thermal long johns, to be released this Fall! We understand. It can be daunting to plan a camping trip with kids. Transporting food, water, shelter, sleeping bags, clothing, sunscreen, bug spray, and other survival basics to the woods is a challenging task—even without a kid or two running around. Although we aren’t exactly “camping people,” we have camped every summer for the past four years with our kids. At times, we love the idea of camping more than the act itself - sweating profusely under the sun as you set up your home in the wild, swatting at the bugs, and sleeping on hard ground can be challenging! But it's nothing that parents can't handle. After all, we are PARENTS-- well trained in sleep deprivation and plenty of discomforts ;). And it's all worth it. It’s worth it for those moments when your kids immerse themselves in nature’s tasks perfectly suited for childhood — scrambling up and down little boulders, inspecting logs, digging in the dirt, and exploring what’s around the next bend. It's worth it as they fall asleep as you read a bedtime story with the glorious sunset shining into your tent. It's worth it when they wake up and tell you "I want to camp for 100 days!" It's worth it when the company of each other is all you need, away from life's busy distractions. * Car camp. While a remote, beautiful camping spot to call your own would be ideal, hiking in with kids and gear to find it may not be all that realistic, especially for the novice! We've done all of our camping at car-accessible sites. Drive right up to your home in the woods and avoid having to lug all of your gear very far! * Use Hipcamp. It is still possible to find that secluded spot - this summer, we camped in someone's 23- acre backyard! Browse your area on Hipcamp, which is like an airbnb site of land. You can find unique experiences on ranches, privately owned land atop a mountain, farms, nature preserves, etc. * Avoid a bright tent. If you’re in the market for a tent, stay away from bright colors! It's expected that bedtime will be a bit later with the sun streaming into your tent and wake-up time a bit earlier. However, if your tent is bright yellow, those stimulating colors can make sleeping that much harder. Brightly colored tents just catch and hold onto that light, making it seem brighter inside the tent than outside. * Prepare meals ahead of time. This year, there is a fire ban in much of Colorado. Since we don't have a camping stove, we brought food that was all ready to eat, like pasta salad, sandwiches, raw veggies and fruits, etc. Although cooking over the campfire is super cozy and can be a big part of the camping experience, we were forced to forgo that luxury. Food in the outdoors will still taste extra tasty even if it isn't hot over the fire! * Exercise those muscles in letting go. On our last camping trip, our five-year-old twins decided to dig a hole with pointy sticks. They worked on this whole for about 45 minutes and were covered in dirt — literally from head to toe. I was about to tell them to stop getting so dirty; after all, we didn’t have a shower to rinse them off before bed. But then it hit me: we’re camping…we’re supposed to be dirty! * Have your kids set the itinerary. Naturalist philosopher, Henry David Thoreau, described his childhood occupation as a “self-appointed inspector of snowstorms and rainstorms.” Kids have an uncanny ability to find the good stuff in nature and to let their senses guide them on adventures. Sure, we have to set rules and boundaries as parents, but we also have to remind ourselves to step back sometimes so as to let our kids step-forward (and, in the process, show us the good stuff from nature!). Free to be, your little explorers will surprise you in their ability to adventure in the wild! * Wear merino. Of course you knew we would say this, right? But really, you want your kids to be comfortable. Since merino is temperature regulating, quick drying, antimicrobial, breathable, and super soft, it keeps your kids comfy day and night. Bonus- avoid bringing one less outfit for the day time! Our kids slept in their merino long johns, and then woke up the next morning all ready to explore the woods. Here is our packing list we used to load up our Subaru. With car camping, although it is easy and tempting to throw in anything and everything, we like to remind ourselves that we are not moving to the woods. Use the opportunity to let go of some of that dependency on convenience, and prepare to be amazed at how you can get by with less. merino wool baselayers and clothing (VERY important ;)! Did we forget any essentials? Let us know your go-to's and tips! And one last bit of inspiration, courtesy of John Muir: "Climb the mountains and get their good tidings. Nature's peace will flow into you as sunshine flows into trees. The winds will blow their own freshness into you, and the storms their energy, while cares will drop off like autumn leaves." It's the first official week out of school and "mom camp" as my kids call it has officially begun. As a work-at-home parent, summer break equally excites me and worries me at the same time. As I think about these fleeting years of them growing too big too quickly, I look forward to cherishing these days together making memories under the sun. At the same time, as one that thrives on routine and rhythm, the complete openness of summer break has me feeling unsettled and nervous! Our kids will often wake up and wonder what day it is- "Is it soup snack day at school? Is it church day? Is it swimming class day?" Having some consistency week to week provides them (and me!) with a sense of security. When we paint a mental picture of the day for my kids, it prepares them to be resilient, open, and eager for the little adventures ahead. At the same time, I want them to be able to use this summer time to explore their little hearts out, filling their cups with what speaks to them. I also want to avoid over-scheduling them and instead give them plenty of room to direct their own play. Someone asked us this past weekend- "what are you goals for the summer?" Have fun was the best answer we could muster! But as a I reflected, it hit me: our goal is to find the balance between rhythmic routine and free-spirited exploration. To see what we may be crafting or creating in the kitchen, I've finally started using that fancy pinterest app ;), and you can see here what we have on our bucket list. Having many of the supplies on hand already has given me some feeling of preparedness, while also allowing for spontaneity to create when they so choose. With a little luck and patience, we'll find the right balance between rhythm and free-spirited play this summer. Here's to you and your little adventurers this summer too! PS The book "Play the Forest School Way" has given me many ideas for nature-based play and I always rely on it to help me through school breaks! We've been dreaming of our summer adventures ahead, and realized what all of our favorite past vacations with our kids have in common- the wild. Those places where it's just us, natural beauty, and the fresh air. Peter Stark, author of "The Last Empty Places", spoke of our favorite environmental philosophers John Muir and Henry David Thoreau - “From the time they were young, they felt an urge to seek out these wild places, to explore them, to ramble through them, to love them. In some ways, it was a search — as it’s been for me — for a childhood paradise lost, to recapture those exciting jaunts through woods and fields and streams.” This is what calls us, to share the free spirit and beauty of Mother Nature with our children. And so, if this is something that calls you too, here are some of our favorite trips with our children, where we were able to share that meaningful connection to each other and the natural world. With it's relaxed vibe, small town charm, and access to abundant natural beauty, Ojai would be at the top of our destination list all by itself. But, throw in a stay at Caravan Outpost, an oasis on the edge of town with 11 airstream trailers, and we'd visit here again and again. The staff is super knowledgeable about the area and has great recommendations for good food and fresh air. And, we were spoiled with s'mores, every. single night. Grab the Diego trailer if you can - it has a small bunkbed that your kids will obsess about. We admit it. Sometimes we like the idea of camping more than the actual camping. Bugs, rain, unnerving nighttime noises from critters…it can be a trying experience. But there’s something uplifting about adapting to a new environment and venturing away from the comforts of home. For the past three years, we've made sure to pitch a tent at least once a summer. We've learned that in camping and in life, the rough spots sometimes pave the way for happiness. And I can say that with every camping trip we've had, happiness was surely made. Read more here for some of our tips for camping with kids. While campsites are great, we've recently found some bucket list places to camp on hipcamp. You can stake a spot on someone's private property for truly out in the wild experiences. Going her own way. We tend to go the opposite direction of all the people. There was a steady stream of hikers, all on the same path making their way to the highest dune. We opted to go our own way; it may not have been the highest peak, but the wildness was hard to beat. I never realized how much I love the arrival of spring until I became a parent. Kids notice the good stuff. Last spring, our kids showed us how our flowers close at night and open as the sunlight’s warmth reaches them. This spring, they excitedly run outside and show us which new flowers emerged—tulips, daffodils, and wild flowers popping up with spring. They lead us on “nature walks” through our neighborhood, pointing out the new flowers and bending over to smell them. They also love to trick us into smelling a popular flowering tree in our neighborhood that, well, does not smell sweet or pleasant! They laugh as we crinkle our noses. I love spring as a parent because I see so clearly how our kids live through their senses. They gently touch, smell, and gaze at spring’s flowers. They dig in the dirt, finding worms in healthy soil. As grownups, we often live in our minds, not through our bodies as our children do. Their senses guide them on little adventures, letting them see and smell and touch nature’s goodness. Spring offers a chance for us parents to experience the world through our senses too. Our kids rekindle something within us that is both familiar and inspiring. And yet, as parents, we also worry about nature—specifically, our collective impact upon the air we breathe, the water we drink, and the environment for which we care. We wonder what kind of natural world we are leaving to our children. However, we have chosen not to burden our kids with this reality just yet. They are young, and we believe that they will learn to care for the environment by learning through their senses as kids. Sure, we teach them about composting (“Isn’t it amazing that our banana peel will turn back into healthy soil for other plants to grow? !”), recycling (“They’ll be able to make something new out of this!”), and the outdoor mantra of leave-no-trace (“Other people will be able to enjoy this field of wildflowers too!”). But we don’t burden their little minds with fatalistic notions of what is happening to our natural world—not yet at least. We teach them that Mother Nature is delicate and yet resilient too, pointing out that our tulips survived the spring snowstorm. And we let them learn for themselves, through their senses, just how majestical Mother Nature truly is. As they grow up, they will learn all about the challenges we collectively face as a species living on Planet Earth. And perhaps they will inspire solutions and effect changes in how we live and interact with the natural world. But in the meantime, they are learning to love nature with all their heart. And for us, that’s a great start. When we launched Chasing Windmills in 2015, we shared the vision for our little company. We stand by our vision, by our hopes and dreams, by our quest to connect genuinely with our customers and bring a bit of nature’s goodness into your lives. We are grateful for your support, for helping this little small business grow, and for making us a part of your family’s adventures. As we grow, however, we find ourselves spending more time on the day-to-day challenges and opportunities of running the company and less time dreaming about our vision. And so, today on mom-and-pop small business day (yes, it’s a thing! ), we’re taking the time to reflect on our journey and assert our vision going forward. We believe in living life intentionally, deliberately making choices for ourselves and our children. We believe in simplicity, understanding the freedom of enough and the stress of too much. We believe in Mother Nature, trusting that she will provide for us better and more wholly than any artificial creation. We believe in the wisdom of childhood, embracing play and resisting the urge to treat our kids as mini-adults. We believe that adventures come in all sizes, embracing the little adventures along the way. We believe in a gathered table, breaking bread with family and friends and sharing the goodness of a wholesome meal. We believe in slowing down, taking deep breaths, and recognizing the incredible gift we have to explore this beautiful world with our children. We believe in the light deep within our children and we embrace the future that, someday, they will create. Yes, we are a small business, run by a mom and a dad. On any given day, our emotions run the gamut from hope to doubt to stress to relief to disappoint to happiness. At times, it is easy to get caught up in the rollercoaster of life. And sometimes, we need to remind ourselves that we are the creators, not the passengers, of our lives. We find it useful to assert our vision, our values, our hopes and dreams, to re-center ourselves. As part of this community together, we would love to hear your visions too. What do you believe in, for yourself and your family? Our tradition the past 3 years has been to celebrate the start of spring with our naturally dyed flower imprinted Easter eggs. There's something to be said when you can appreciate each step of the process just as much as the end result. From the gathering of the first blooms in our yard, to the tying of the eggs, to the fishing out from the dye baths- each step generates so many "ohhh it's so beautiful! "s and "oh my goodness how precious! "s, reminding me to find comfort and contentment in this sweet journey of life. I thought I'd share our process for making ours in case you have yet to make your springtime eggs! - Prepare hard boil eggs and cut the old pantyhose into approximately 4 inch pieces. Since the whole process of flower imprinted eggs can be a bit more time consuming, I try and prep what I can without the kids so that when they are ready to dive in, I can have the materials all ready to go. This is an easy step that I can do the night before. - Collect small flowers and leaves. This is one of my 5 year old twins' favorite part. We love walking our yard together and seeing what is popping up, and it's a little celebration of spring in itself. Usually not much is blooming yet, but the tiny flowers we find are just the perfect size for the eggs. Fern-shaped leaves also turn out beautifully. - Prepare dye baths. Since the wrapping of the eggs can take a bit of time, I always get the dye baths going so they can boil while we wrap. I used this tutorial for preparing the dyes. - While the dye baths are boiling, we wrap our eggs. The actual wrapping is difficult for children, so they help me with picking what they want to put on the egg and laying it on for me. Most flowers we put face down as it is easier to get flat that way. - Slowly drop the eggs into the dye bath jars. Usually, I keep it simple with just two dye colors. And in a 3rd jar I mix the two colors together to see what happens! Refrigerate until desired color is reached- we soaked ours overnight. This also teaches delayed gratification since you have to wait quite a bit! - Fish out the eggs with a spoon and carefully cut the nylons open and remove from egg. Gently pat dry with a cloth and enjoy each unwrapping as your children squeal in delight! The left ones were the beet and red cabbage dyes mixed- I expected them to turn more purple-y but perhaps I had more cabbage dye than beet! The middle ones were the red cabbage and were my favorite. The right were the ones soaked in the beet dye, which didn't come out as intensely pink as they had in years past but I love the subtle nature of them! Thanks to Michelle @danceypantsdisco for inspiring me years ago to try this with my kids. I love that it is now our own little tradition.